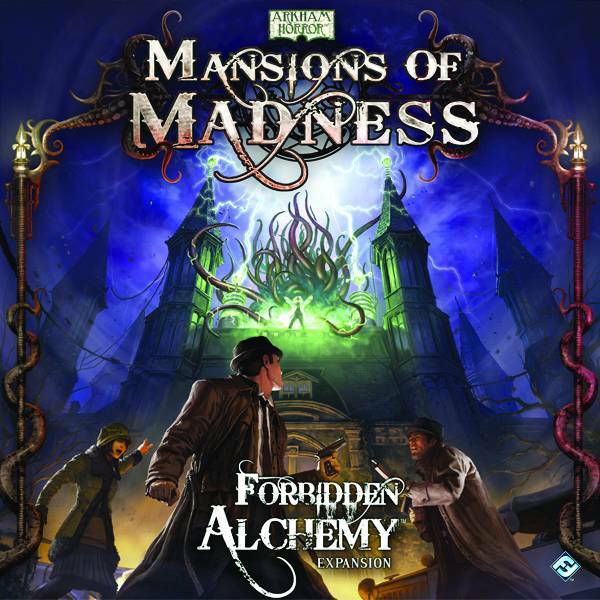 Forbidden Alchemy is sure to concoct a draught of devilish delight! Folks, there’s no hiding my love for all things Lovecraft in gaming. I’m a true sucker for a game of Arkham Horror, and now many of us have had the opportunity to go mad for Mansions of Madness. This great storytelling board game has become an instant favorite with me, and for a short time, some of us out there wondered if this fabulous game was ever going to see an expansion. Until I truly dug into the meat of the game, it looked pretty self-contained. The parts and puzzles that came with the game didn’t allow for much leeway in mixing things up. There would always be rune puzzles and wiring puzzles to solve, and the weapons and gear were pretty straight-forward, allowing little variation, or seeing anything new. There are but FOUR spells in the game (much to my chagrin), and they seem to cover every aspect of gameplay. Worse still, there were FIVE stories in the core set, and even though there are several choices to make in these stories that could be radically different, each premise was still the same. Mansions looked doomed to be a one-hit wonder.